One year ago I wrote a post comparing the MAC to the Big Ten. Using the Sagarin rankings we were able to tell the MAC had some teams that were able to slug it out if they were in the Big Ten. Time to breakdown the rankings to see if the MAC gained any more ground in 2012. 2012 Sagarin rankings MAC vs. Big Ten. I found it disappointing to locate Northern Illinois at No. 39 being a BCS team. However the weak schedule the Huskies played watered down their ranking. The only top 30 team at the end of the year NIU played was Florida State. Kent State fared worse finishing the year No. 60. The Flashes were knocked again for not playing a single top 30 team. Ball State comes in at No. 67, ahead of five Big Ten teams. Toledo, Bowling Green, and Ohio follow giving the MAC six teams in the top 75 of the nation. By MAC standards that is striking oil. That means half the conference is capable of being decent in every conference in the country with two exceptions being the SEC and the Big 12. Seven out of the 10 Big 12 teams finished ahead of Northern Illinois in the Sagarin rankings. Still, having six teams in the top 75 is a big achievement for the MAC. The problem is the bottom half. In 2012 there were 124 schools in FBS so having teams outside the top 124 means they were passed by FCS schools like Indiana State. Five MAC schools are guilty as charged in No. 125 Miami University, No. 131 Buffalo, No. 146 Eastern Michigan, No. 169 Akron and No. 178 Massachusetts. Their poor rankings are why the top of the MAC was dragged down. Northern Illinois played the bottom four MAC teams, FCS UT Martin, and Army. Those six cupcakes gave Northern Illinois a No. 121 strength of schedule ranking. The most successful MAC team with a challenging schedule were your 9-4 Ball State Cardinals. Ball State had the second toughest strength of schedule at No. 73 and was deprived of the opportunity to play Akron and UMass. Eastern Michigan was the victim of the MAC’s toughest schedule at No. 71. Losing to FCS Illinois State made going 2-10 even more painful. While the top teams in the MAC are cruising, other teams are sinking and holding the MAC back. So what does all this mean? If another MAC team is going to make a run at the BCS or the future playoffs a few things will need to happen. One option will be the bottom half of the conference stepping up. 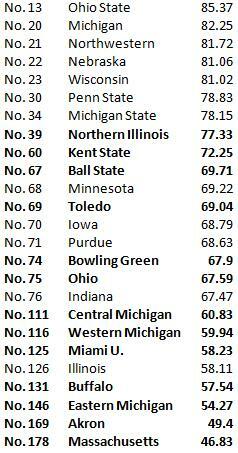 Akron and UMass did damage to the BCS rankings of Northern Illinois and Kent State this past season. This could be fixed through those cupcake schools finding wins in non-conference play. The other option would be the top of the conference gaining more quality wins. In 2012 the only win the MAC scored on a top 30 team in the Sagarin rankings was Ohio’s upset at No. 30 Penn State. The MAC had other wins against BCS conferences but most of those wins came against the basement dwellers of those conferences. Northern’s run to the Orange Bowl was huge for the conference showing a MAC team can get on the big stage. Now the MAC needs to find a way to sustain it and improve the bottom half. While we are still far away from a MAC school competing for a national title, it is no longer idiotic to suggest it can be done. Never thought we could say that.